The CETA agreement is no exception. The figure below shows that trade costs between the EU and Canada have been decreasing over time starting from a common base, i.e. 100, as illustrated by the dark blue line except during the Global Financial Crisis. 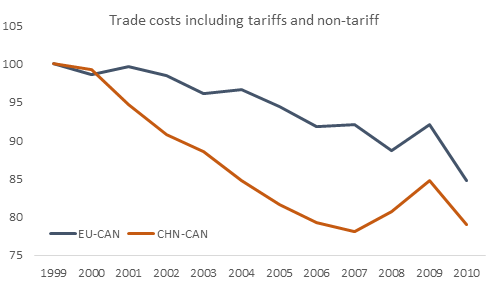 Note that trade costs include tariffs as well as non-tariff measure. This picture shows a rather good sign and therefore one may wonder why a trade agreement is necessary in the first place. Read more about this in ECIPE's Bulletin that just came out!